Welcome to my June 2014 income report! I do this not only to help me keep track of my own progress, but I want to be open and honest about what’s going on in my business. I want to lead by example by showing you what is working and what is not. For those of you new to Smart Passive Income, you might be wondering why I care to post my income reports online. Although you’re not investing money into my company, you are investing time to consume my content as well as any time you use to execute the strategies and methods that I share through example. It’s my responsibility to be totally upfront, honest and transparent with you, and to give you a snapshot each month of how I’m performing. If you’re just starting out and you’re thinking about creating a business of your own, please understand that making money online is definitely NOT an overnight thing. There are many people who claim that there are such things as easy instant riches or push-button success, but in my experience, that’s far from the truth, and that’s a primary reason why this blog exists and why I do what I do. It takes a lot of hard work and dedication to pull it off, and often times you may work for a year or more before seeing any real returns from the work that you do. The environment is always changing, which is why I continue to experiment and try new things and share my results here with you on the blog. I struggle through trial and error every single day too, so as long as you have a goal and constantly work towards it despite all of the hiccups, hangups and hurdles, you’re giving yourself a great chance for great things to happen. The only truth is if you don’t take action, you will never see results. Now, let’s jump into June’s report. 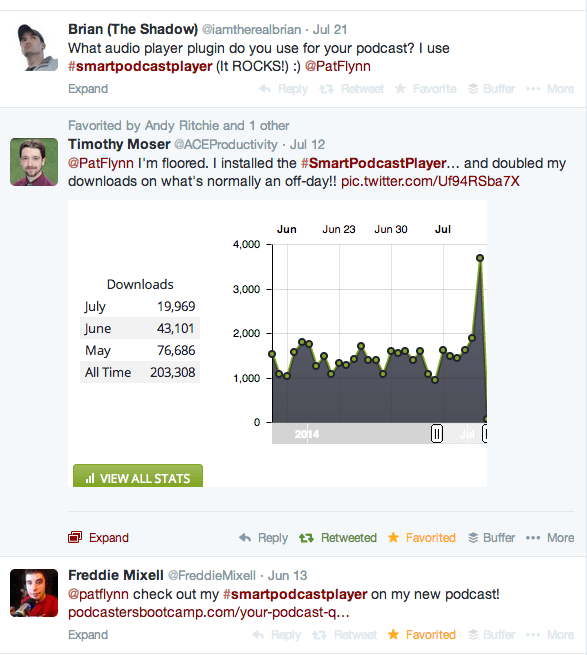 The biggest news from June is the beta launch of my first piece of premium software, The Smart Podcast Player. You can see the player in action on AskPat.com, which was built custom for that particular podcast and page. After a ton of comments about how great the player looked and requests from people to get their hands on a copy of their own, it only made sense to turn it into something that could be distributed and sold. On Thursday, June 12th, my team and I successfully launched the premium WordPress plugin and sold out the 250 beta licenses that we made available within a 24 hour period. Capping the licenses to 250 on this first go-around turned out to be a very smart idea. Immediately, we were met with a number of compatibility issues, but we were ready for them. I made a huge deal to my team to make sure we had the systems in place to handle customer support after the plugin launched, because I learned through several conversations with other plugin creators that we were going to run into bugs and malfunctions, even though we spent weeks testing various scenarios trying to break the thing. My customer support team for the player, Mindy, Jessica, and Jonathan, did an amazing job. So good, in fact, that I received a number of grateful emails from customers telling me how awesome the experience was, even though the plugin didn’t work at first. We launched very lean. Very MVP (minimum viable product). We purposely left out a lot of ideas and features of the player because we wanted to launch sooner than later, and work with the existing beta users to see what features were most important. As a result of the launch, within that 24 hour period the player (sold at an early-bird beta price of $47) earned a total of $14,026, which includes a small percentage (9 sales) of a second-tier option, a “Studio License” priced at $397, which allows users to use the player for up to 10 different podcasts. The best part about this whole experience, however, was the fact that the next morning when I woke up, I received at least a dozen emails from people with links to the page on their own site where the podcast player was already up and running. It was awesome to see the work my team and I put into this project already being used and appreciated by others. Since the launch a month ago, the customer service requests have fizzled out, and we’ve delivered a few more versions to existing customers with bug fixes and additional features. Our next step is another beta type launch to get another group of users in there to run more tests, field more questions and gather more data. We’ll be doing this a few more times before opening it up for good. This “side project” has become a lot bigger than I ever thought it would be, and I’m so excited to see what lies ahead for it. If you’re interested in getting your hands on the player when it becomes available again, just sign up for the waitlist at http://www.smartpodcastplayer.com. As many of you know, FoodTruckr.com, a niche site I started over a year ago (click here to read about how it all started) is on a slow but steady pace toward something great. Currently, the site sits on the first page of Google for several relevant keywords, including the #2 position for how to start a food truck, which is great. No forced backlinking, private blog networks or anything considered gray hat was done to get these rankings, it’s just a matter of consistently producing content that people want, and being patient. Unfortunately, some people (probably those who read the SPI blog) have tried to sabotage the experiment by sending thousands of backlinks from crap sites with anchor text that match certain kinds of pills that are used for things I cannot say because this is a family friendly blog. Despite all of that, and some disavowing efforts on my end, the site is still ranking very high and getting a lot of good, targeted traffic from Google each month. In the last 30 days, the site saw a total of 24,272 unique pageviews. 17,394 of those unique pageviews are coming directly from Google. There’s definitely an upward trend in searches relevant to food trucks, and I’m stoked to have gotten in front of a lot of that at the right time. In terms of income, the first and small monetization experiment using Adsense I started 3 months ago is still…small. In June, the site earned just $83.48. Mind you, I only spent 5 minutes a few months ago plugging Adsense code on my most popular post and in the sidebar, and to see an extra hundred dollars come in each month (except this month), even though it’s small, is still very encouraging. I’m excited, however, because the first FoodTruckr product is on it’s way to the market; an eBook that will be sold directly on the website and should boost revenue for the site many times over. 150 people have already expressed interest on a sign-up page, and more are signing up every day. The goal here is revenue (beyond providing value, of course) which is why the book will be sold directly on FoodTruckr.com Nathan Barry style, which includes higher prices with tiered packages and offerings. The eBook by itself becomes the base price, but the additional content and bonuses, if positioned correctly, can drastically increase overall revenue from a sale. The book is coming together very well. My development team is in the middle of getting the sales page ready, and it’ll be a fun experiment and I can’t wait to share the launch process, pricing strategy, as well as the outcome of the sale with you very soon. The book launches mid-August. GreenExamAcademy.com saw a HUGE spike in sales, and then halfway through the month sales completely fell off the cliff, all the way down to zero. None for the rest of the month. Don’t worry though. This was 100% expected to happen. There was a deadline on June 15th to pass the old exam, before the new exam comes out later this year. Now that the deadline has passed, there’s nothing to sell study guides for, and there isn’t even anything I can use to gather information to share on the site – so the site is at a standstill for now until I get further information on the new exam. All I can do is continue to build my email list and keep my eyes open for new opportunities and potential partnerships. The site, since it’s birth in 2008, has earned close to half a million dollars (including affiliate commissions), and I definitely don’t plan on letting it sit there earning nothing longer than I have to. 1-Day Business Breakthrough with Chris Ducker! Halfway through June, I had the pleasure of seeing my “brotha from anotha motha” Chris Ducker and his family roll into my hometown. He and I both presented at Digital CoLab (which was great! ), and then later we held our third live 1-Day Business Breakthrough Mastermind Workshop in San Diego. We spent a full day on June 27th with 19 other lively entrepreneurs from all around the US, and it was amazing! It’s always amazing, but it just seems to get better and better each time we do these events. After the group dinner, Chris and I were walking back to my car and we were talking about how much we enjoyed the day, the attendees, and all of their kind words and excitement. Something truly amazing happens when you get that many like-minded people in a room together, from all different levels, niches and backgrounds, to help each other out – it’s truly magical. Chris is in New York for a book party as I write this post, but after a trip back home he’s on his way back to San Diego in September, and as always, whenever we’re together we put on a 1-Day Business Breakthrough event. The next one happens on Monday, September 15th from 8:30am to 9:00pm. I’m not going to write a huge pitch for you here, but if you’re looking to grow your business big-time and connect with others and you want to learn more about how this can help you, feel free to check out the event description and accompanying video here. Okay, let’s break down some income streams. A couple of months ago, I launched another project that my team and I had been working on for several months: The Smart Passive Income iPhone Application, which combines my blog content, as well as both of my podcasts (SPI and AskPat) in one convenient location on your iPhone, with the ability to filter and search through content, and even get notifications when new content is available. I’m happy to announce that as we speak, the Android version of the application is being built too. I know a lot of you are Android users and I definitely didn’t want you to feel left out. I don’t have an exact launch date, but you can be sure that once it’s available, I’ll let you all know. In the meantime, if you have an iPhone or iPad and haven’t picked up the iOS app, you can download that for free right here. The last thing I want to mention in this month’s report is about June 15th, 2014 – which is significant because it was my 6th year anniversary since getting laid off – a day I call, Let Go Day. Only the past couple of years have I celebrated this day with all of you (with a live stream with giveaways and guests to literally celebrate the day), but each year since that date in 2008 I’ve reflected on the crazy, amazing and humbling journey I’ve been on. In Malcolm Gladwell’s new book, David and Goliath, he talks about the advantages of disadvantages, things that seem unfair; things that you actually wouldn’t want to happen to you, but when they do you’re actually given an advantage. This goes along with the primary theme of the book about the winning underdog (in business, life, sports, history, etc.) – hence David and Goliath. One of the advantage of disadvantages examples he uses in the book is about those who are born with dyslexia. It’s extremely tough to grow up with dyslexia – it’s incredibly hard to read and most students will fall behind in school and have to work extremely hard just to get average grades. In a radical number of cases, however, people with dyslexia become incredible leaders in business and entrepreneurship. I won’t spoil the juicy stats and incredible case studies from the book in case you haven’t read it yet, but often times the hardships that people have when growing up with dyslexia end up helping (and forcing) them to develop other skills that are perfectly suited for leadership and entrepreneurship roles. There’s another example in the book that boggles my mind about how many top entrepreneurs, and even Presidents of the United States (about a quarter of them) grew up with a death of a parent before the age of 16. You’d never wish that on anyone, but the death of a parent before the age of 16 seems to mold a person into one that has the ability to do what it takes in order to succeed, perhaps because they grew up with more to take on as a result of their loss, or it could be because they’ve already experienced something so traumatic in their life, that failing at business and getting rejected along the way (which is an experience all business owners have to go through) isn’t something that fazes them because it doesn’t come close to what they’ve experienced in the past. In the same way, I would never wish getting laid off on anyone. It was one of the most depressing moments of my life. I was angry, frustrated, confused, but mostly scared because I didn’t know what the future was going to look like. But, in retrospect, my lay off was a catalyst. I began to think outside of my normal self. I began to explore options that were never options before and I did things outside of my comfort zone because – well – I had nothing else to lose. I felt as if I had already lost everything. Not having an absolute secure job, and not having a plan B to go along with it can be considered a huge disadvantage in life, but it was that disadvantage that gave me the ability to find a path that led me to where I’m at now. I don’t wish bad things on anyone, but bad things we can’t always avoid. When they do happen, know that most of the most amazing things in life come out of the unexpected. It may take a while to see and experience it, but after the fires, the green always starts to grow again. Thanks to everyone who was there to help me celebrate Let Go Day this year. We’ll do it even bigger and better next year.